Social justice can’t be achieved until we move beyond our own body hatred. 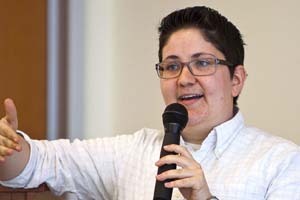 That was the message from Cuban-American writer/activist Miriam Zoila Pérez, who spoke to a group of Tidewater Community College students at the Norfolk Campus as part of a Women’s Center presentation for Women’s History Month. Pérez writes about issues relating to gender, race and health for various national publications and anthologies. Pérez was a sophomore in high school when her father took her to a doctor concerned about her weight. She was perplexed, particularly when the doctor put her on the drug Meridia, which did not work well for her and has since been withdrawn from the market due to its adverse side effects. Pérez’s battle with weight and self image continued into her college years, and it is only within the last few years that she has been able to look in the mirror and accept herself for who she is. “We all experience body hatred,” she said, noting the problem doesn’t always stem from excess weight. Sometimes it’s skin color, height, hair that’s either too straight or too curly – the list goes on.